SmileCare dentists in San Diego are collecting new stuffed teddy bears at its eight San Diego-area offices now through December 5 to benefit children undergoing treatment at Rady Children's Hospital. 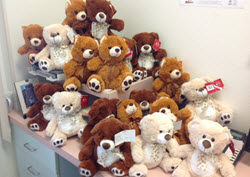 Eight San Diego SmileCare offices are accepting teddy bear donations to benefit sick children. The SmileCare spirit is all about caring, serving, and giving back. SmileCare dentists in San Diego will be delivering even more smiles during the holidays this year. The SmileCare team of specialists and general dentists in eight SmileCare locations are collecting new teddy bears and other stuffed animals for the 24th annual San Diego Regional Law Enforcement Teddy Bear Drive during the holidays to benefit children undergoing treatment at Rady Children's Hospital. The teddy bears are sure to bring smiles to the faces of the children, creating comforting memories to last a lifetime. "The SmileCare spirit is all about caring, serving, and giving back," said Dr. Geoff Kopecky, an orthodontist at SmileCare who led last year's effort to collect 200 teddy bears. "We're very excited to partner with the teddy bear drive again and make a difference in our community." From now through December 5, people can drop off a new stuffed teddy bear, with tags attached, at any of these eight San Diego-area SmileCare locations. 1333 Camino Del Rio S.
The Teddy Bear Drive was started in 1990 by Coronado Police Officer Brian Hardy. Since then, more than one million stuffed animals and teddy bears have been donated through the annual drive for Rady Children's Hospital. It's grown to include participants from police, sheriff, state, and federal law enforcement agencies and local sponsors. Each year the drive collects over 75,000 bears to brighten the day of sick and injured children visiting Rady Children's Hospital throughout the year. SmileCare is proud to be a partner to help it reach its goal. SmileCare Coast Dental of California, Dental Group of Adam Diasti DDS PC, with its professional associations, is one of the largest providers of general and specialty care in the United States with more than 175 affiliated practices operating as Coast Dental and SmileCare in Florida, Georgia, California, Nevada and Texas. SmileCare offers family dentistry services and orthodontics at all of its California locations, plus many offices offer pediatric dentistry, oral surgery, endodontics, and periodontics. SmileCare accepts more than 200 types of insurance, and has special offers for patients without insurance. To find a location or request an appointment, call 1-800-32-SMILE or visit SmileCare.com.